Osseointegration is a measure of implant stability., A successful implant reflects good bone to implant contact and is determined by implant stability both primary and secondary. Primary stability is attained by mechanical engagement of implant within the cortical bone., This depends on bone density, surgical technique and implant geometry. Secondary stability results from regeneration and remodeling of bone and tissue around the implant, that is, influenced by primary stability, bone maturation, remodeling, and bone density with time., Primary stability has been identified as a prerequisite to achieve osseointegration and is positively associated with secondary stability. The attainment of direct contact between implant and living bone influences implant stability at the time of surgical insertion and in the lack of micromotion during the healing period. Implant stability is the absence of clinical mobility which also suggests osseointegration. Measuring implant stability is essential for evaluating the long term success of implant. Measuring implant stability through various techniques could assist the clinician in an optimal treatment plan and support decisions regarding implant loading protocols on a patient to patient basis and provides better case documentation. 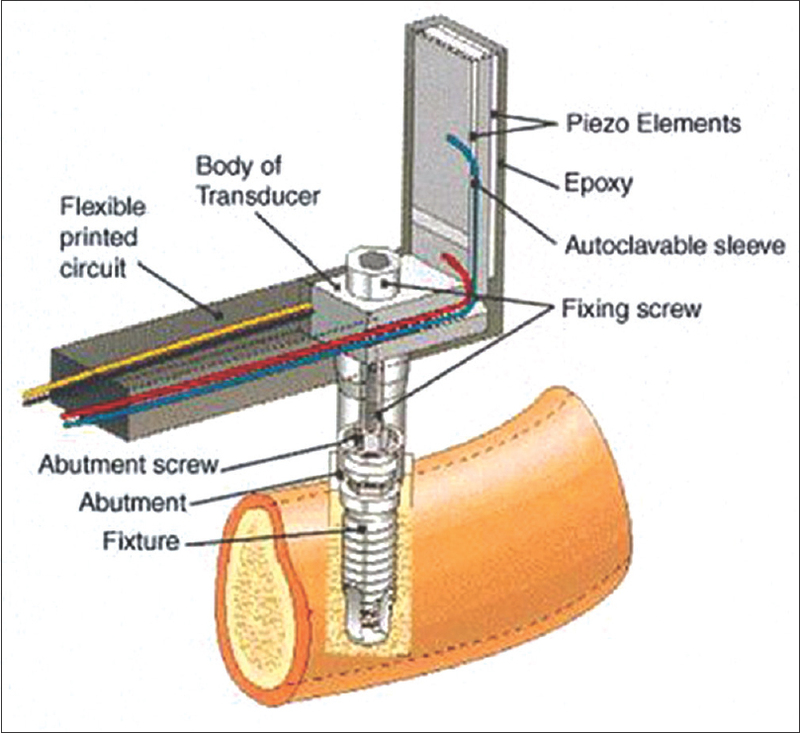 Various methods are developed to assess implant stability such as histologic analysis, radiographs, percussion test, reverse torque test, cutting torque resistance analysis, periotest and resonance frequency analysis (RFA) device.,, Historically, the gold standard method to evaluate osseointegration was histologic analysis. Later, implant stability and osseointegration are clinically determined by tactile perception, radiographs, percussion test, reverse torque test, cutting torque resistance analysis, periotest, and RFA. Friberg et al. evaluated the jaw bone quality at implant placement with cutting torque measurements and to compare these values in different regions in mandibles and maxillae to identify implants at risk for failing. Cutting torque measurements performed for a minimum of 3 years by comparing cutting torque values of maxillae and mandibles and of different jaw regions revealed that cutting torque values correlated with radiographically, clinically assessed bone quality scores. Conversely, it was not possible to identify sites at risk for the future implant losses or to determine a lower limit value of cutting torque to achieve successful implant integration. Sullivan et al. assessed the relation between reverse-torque analyses to failure on implants. Clinical analysis after reverse-torque testing and loading, revealed that there is no increase in failure rates with no failure rates between values of 45 and 58 Ncm. Reverse-torque testing at 20 Ncm appears to be a safe, reliable method for verifying osseointegration with pure titanium screw-shaped implants. Kaneko evaluated the sensitivity of pulsed oscillation waveform to analyze the mechanical vibrational characteristics of the bone implant bone interface using forced excitation of a steady state wave and the sensitivity was low in the direction, for which a normal load was applied to the bone, reflecting a mechanical difference of the surrounding bone and/or the interface. Therefore, it is desirable that the assessment by the vibrational test is done in the direction, for which a shearing load is applied. They stated that the minimum average thickness of soft interface layer distinguishable from a hard interface depends on load directions and positions. Kaneko et al. introduced a simple acoustoelectric technique for in vivo assessment of the interfacial rigidity between a dental root implant and the bone surrounding it. This method is based on estimating the frequency (10–150 KHz) and amplitude of the vibration of the implant induced by a small pulsed force. Application of the force to the implant and detection of the vibrational signal from the implant are performed by lightly touching it with two fine needles connected with piezoelectric elements. Olivé and Aparicio assessed the use of Periotest method as a measure of osseointegrated oral implant stability and suggested that the periotest value of an oral implant is an objective and easily applied criterion for stability assessment. Since osseointegration is achieved gradually over time, this test may assist the clinician in deciding whether to extend the healing period before loading fixtures that seem clinically and radiologically integrated but give borderline periotest values. Olsen et al. introduced a novel computational method for real-time preoperative assessment of primary dental implant stability which allows fast and fully automatic structural analysis during preoperative planning for dental implant surgery. This method integrates a fully automatic fast finite element solver within the framework of new concepts in computer-assisted preoperative planning for implant surgery. The resulting displacements were measured and compared with those predicted by numerical analysis during planning. The results show that fast structural analysis can be integrated with surgical planning software allowing the initial axial implant stability to be predicted in real time during planning. It is believed that such a system could be used to select patients for immediate implant loading and when further developed, will be of use in other areas of preoperative surgical planning. Limitation of these methods, therefore, led to the development of other diagnostic tests that are noninvasive, clinically applicable, user-friendly, and reliable to measure implant stability such as the RFA device. Meredith et al. in 1996 first described the RFA for implant stability measurement which is commercially available as Osstell, Implomates, and Penguin. This technique measures the resonance of a transducer that is attached to implants to correlate with micromobility or displacement which in turn is determined by the bone density [Figure 1]. The RFA technique provides clinically relevant information about the state of the implant–bone interface at any stage after implant placement. It can be used as an additional parameter to support decision-making during implant treatment and follow-up. To evaluate the bone quality and degree of osseointegration of an implant various methods have been proposed. These include histology, histomorphometry, and removal torque analysis. In course of time, the limitations of invasiveness and inaccuracy were overcome by designing noninvasive devices such as Periotest and RFA device. These are used to assess clinically the implant stability over a long-term period, yet periotest values do not always precisely correspond to biomechanical parameters. Unlike the periotest values, the RFA values strongly correlate with changes in implant stability during osseous healing and failure of implants. Evaluation of the reliability of Osstell™ and Periotest devices in assessing implant stability revealed that both devices are noninvasive, reliable showed strong association to each other in assessing implant stability and can be used in the long-term follow-up of implant integration. Correlation between implant stability quotient (ISQ) and bone-implant contact was assessed utilizing RFA device stating that a significant positive correlation exists between the RFA and BIC values and more bone contact with implant surface implies higher implant stability. Analysis with a purpose of simulating the influence of parameters such as implant length, bone quality, bone loss and quality of transducer fixation on RFA, and damping capacity measurements utilizing periotest and osstell mentor devices, respectively, revealed that both reacted similarly to different parameters of implant stability. Good correlation between periotest and RFA values were observed only when bone loss values were not considered. Investigations on the sensitivity and reliability of Osstell™ compared to Periotest system in implant stimulated conditions revealed significant correlation between Osstell and periometer instruments. Evaluation whether RFA combined with modal damping factor (MDF) analysis provides additional information on osseointegration during dental implant healing status revealed that RF combined with MDF provides additional information on dental implant healing status. MDF analysis can detect changes in the implant/bone complex during the healing period even in implants with higher RF values. RFA is one of such techniques which is most frequently used nowadays and works under the basic vibrational theory that is used to design transducer. The transducer could be excited using a steady state, swept frequency waveform and its response measured to determine the stiffness of an implant in the surrounding tissues. The technique originally used an L-shaped transducer that was screwed to an implant and excited over a range of frequencies. Response of the frequency was analyzed. With the first flexural resonance of beam, amplitude, and phase of received signal changes. Four generations of RFA have been introduced so far. The first-generation device was based on a measuring element transducer placed on implant/abutment and then connected to a measuring unit with a wire. The second-generation device analyses frequency response utilizing the magnetic technology. The third generation device was designed to overcome drawbacks of first- and second-generation RFA devices like the different transducers that had to be calibrated. The third-generation system was provided with a small battery driven system, which enables quick and simple measurements and chair side interpretation. The first commercially available RFA equipment is Osstell™, followed by Osstell AB, then Osstell Mentor and the most recent version of RFA is Osstell ISQ which utilizes a smart peg and a wireless probe attached to the device. The smart peg has a small magnet attached at its top that is excited by magnetic pulses generated from a probe. The activated peg induces electric volt into probe that is sampled by the magnetic RFA device. Implant stability was determined under various surrounding bone conditions by Feng et al. and concluded that RFA could serve as noninvasive diagnostic tool for detecting implant stability during different healing stages in different bone densities. Clinical trials to determine whether RFA can be integrated into routine clinical evaluation supported the need for a tool such as RFA to evaluate dental implant stability before loading. Changes in implant stability measured using both the devices magnetic RFA device and with electronic RFA device correlated significantly during the healing period. Clinical trials were conducted to evaluate the prognostic accuracy of RFA measurements to determine optimal threshold value for predicting failure risk of immediately loaded implants. RFA values can merely indicate that inserted implant is clinically stable but may provide a false sense of assurance in contemplating an immediate implant restoration. To overcome the low sensitivity of RFA as a prognostic tool, a combination of clinical parameters, radiographic evaluation should also be considered before immediate loading. RFA allows the assessment of implant stability by measuring implant oscillation frequency on bone. Meredith et al. 1998 described the noninvasive method of assessing implant stability utilizing the RFA device OSSTELL. OSSTELL devices have been designed since 1999 by the Integration Diagnostics Ltd, Sweden. Within the last decade, numerous generations of Osstell devices have evolved to improvise the implant stability measurements, namely, OSSTELL™, OSSTELL Mentor, and OSSTELL ISQ. It is a noninvasive diagnostic technique that uses a piezoelectric transducer. It emits a sinusoidal signal within a specific frequency meant to make the implant vibrate. Implant's resistance to vibration is measured by the device and transformed into ISQ value. ISQ is measured on a scale within 0–100, 100 being the maximum, and 0 lowest stability values [Figure 2]. The last and latest generation of this device was developed in 2009, OSSTELL ISQ, It includes a new control unit with a probe connected to it by means of a cable. Its use is progressively extending to register the implant stability measurement due to the ability of device to reproduce accurate values without intra and inter observer variability. The Osstell measurements are highly reliable and are alone sufficient to assess the status of implant success. Nedir et al. 2004 evaluated the implant primary stability as a means of predicting osseointegration. However, they stated that all implants with an ISQi >49 osseointegrated when left to heal for 3 months. All implants with an ISQi >54 osseointegrated when immediately loaded. For implants with low ISQi values, decrease in implant stability should alert the practitioner to take precautionary measures. For implants with high ISQi values, reduction of implant stability during first 12 weeks of healing can be considered as a common event. A safe threshold RFA value for planning immediate implant restoration was analyzed stating that implant stability values after 8 weeks showed a better accuracy in predicting implants and optimum cut off value for detecting implant stability was ISQ of 60.5. Primary stability of implants was assessed through RFA using OSSTELL™ and OSSTELL Mentor devices to analyze the comparability and reproducibility of these devices stating that Osstell underestimates implant stability relative to Osstell Mentor score. Clinical trials on efficacy of OSSTELL ISQ concluded the almost perfect repeatability, reproducibility and highly reliability with one measurement. Evaluated the ISQ values using OSSTELL Mentor during implant integration in immediately and nonimmediately loaded implants concluded that RFA using OSSTELL Mentor may offer an objective method to determine the implant stability and for immediate loading. Comparibility and reliability of OSSTELL Mentor and OSSTELL ISQ in measuring implant stability was estimated and the mean values of ISQ for OSSTELL ISQ and OSSTELL Mentor were 72.87 and 72.04 respectively, suggesting perfect concordance, reproducibility and repeatability between these devices. Both at insertion and after healing successful implants showed significantly different ISQ values as compared to implant failures or implants with prolonged healing. However, overlapping ISQ distributions at implant insertion demonstrated that there was no correlation among the data that could be used to predict successful osseointegration. The prognostic value of ISQ values were ambiguous. The RFA technique has been extensively used in clinical research for the last two decades though there are many techniques to measure implant stability. Nonetheless, from available literature, there is still a lack of precise information on the correlation between ISQ values and the short- and long-term implant outcomes. Different authors have attempted to establish thresholds for primary and secondary stability and highlighted the factors influencing to predict higher risks for implant failure. Only repeated measurements over a longer period of time would have clinical significance and prognostic value. Sennerby L, Meredith N. Implant stability measurements using resonance frequency analysis: Biological and biomechanical aspects and clinical implications. Periodontol 2000 2008;47:51-66. Meredith N, Alleyne D, Cawley P. Quantitative determination of the stability of the implant-tissue interface using resonance frequency analysis. Clin Oral Implants Res 1996;7:261-7. Friberg B, Sennerby L, Gröndahl K, Bergström C, Bäck T, Lekholm U, et al. On cutting torque measurements during implant placement: A 3-year clinical prospective study. Clin Implant Dent Relat Res 1999;1:75-83. Sullivan DY, Sherwood RL, Collins TA, Krogh PH. The reverse-torque test: A clinical report. Int J Oral Maxillofac Implants 1996;11:179-85. Kaneko T. Pulsed oscillation technique for assessing the mechanical state of the dental implant-bone interface. Biomaterials 1991;12:555-60. Kaneko T, Nagai Y, Ogino M, Futami T, Ichimura T. Acoustoelectric technique for assessing the mechanical state of the dental implant-bone interface. J Biomed Mater Res 1986;20:169-76. Olivé J, Aparicio C. Periotest method as a measure of osseointegrated oral implant stability. Int J Oral Maxillofac Implants 1990;5:390-400. Olsen S, Ferguson SJ, Sigrist C, Fritz WR, Nolte LP, Hallermann W, et al. A novel computational method for real-time preoperative assessment of primary dental implant stability. Clin Oral Implants Res 2005;16:53-9. Lachmann S, Jäger B, Axmann D, Gomez-Roman G, Groten M, Weber H, et al. Resonance frequency analysis and damping capacity assessment. Part I: An in vitro study on measurement reliability and a method of comparison in the determination of primary dental implant stability. Clin Oral Implants Res 2006;17:75-9. Scarano A, Degidi M, Iezzi G, Petrone G, Piattelli A. Correlation between implant stability quotient and bone-implant contact: A retrospective histological and histomorphometrical study of seven titanium implants retrieved from humans. Clin Implant Dent Relat Res 2006;8:218-22. Winter W, Möhrle S, Holst S, Karl M. Parameters of implant stability measurements based on resonance frequency and damping capacity: A comparative finite element analysis. Int J Oral Maxillofac Implants 2010;25:532-9. Al-Jetaily S, Al-Dosari AA. Assessment of Osstell™ and Periotest ® systems in measuring dental implant stability (in vitro study). Saudi Dent J 2011;23:17-21. Ahmad OK, Kelly JR. Assessment of the primary stability of dental implants in artificial bone using resonance frequency and percussion analyses. Int J Oral Maxillofac Implants 2013;28:89-95. Feng SW, Chang WJ, Lin CT, Lee SY, Teng NC, Huang HM, et al. Modal damping factor detected with an impulse-forced vibration method provides additional information on osseointegration during dental implant healing. Int J Oral Maxillofac Implants 2015;30:1333-40. Huang HM, Lee SY, Yeh CY, Lin CT. Resonance frequency assessment of dental implant stability with various bone qualities: A numerical approach. Clin Oral Implants Res 2002;13:65-74. Valderrama P, Oates TW, Jones AA, Simpson J, Schoolfield JD, Cochran DL, et al. Evaluation of two different resonance frequency devices to detect implant stability: A clinical trial. J Periodontol 2007;78:262-72. Atieh MA, Alsabeeha NH, Duncan WJ, de Silva RK, Cullinan MP, Schwass D, et al. Immediate single implant restorations in mandibular molar extraction sockets: A controlled clinical trial. Clin Oral Implants Res 2013;24:484-96. Nedir R, Bischof M, Szmukler-Moncler S, Bernard JP, Samson J. Predicting osseointegration by means of implant primary stability. Clin Oral Implants Res 2004;15:520-8. Atieh MA, Payne AG, Duncan WJ, Cullinan MP. Immediate restoration/loading of immediately placed single implants: Is it an effective bimodal approach? Clin Oral Implants Res 2009;20:645-59. Snijders RS, van Wijk AJ, Lindeboom JA. A comparative study of the Osstell™ versus the Osstell Mentor™ to evaluate implant stability in human cadaver mandibles. J Oral Rehabil 2013;40:774-9. Herrero-Climent M, Santos-García R, Jaramillo-Santos R, Romero-Ruiz MM, Fernández-Palacin A, Lázaro-Calvo P, et al. Assessment of Osstell ISQ's reliability for implant stability measurement: A cross-sectional clinical study. Med Oral Patol Oral Cir Bucal 2013;18:e877-82. González-Jaranay M, Moreu-Burgos G, Gómez-Moreno G, Rubio-Roldán J, Machuca-Portillo G, Perrotti V, et al. Changes in resonance frequency analysis assessed by Osstell mentor during osseointegration: Comparison between immediately loaded implants and control implants without load. J Osseointegr 2014;6:51-5. Jaramillo R, Santos R, Lázaro P, Romero M, Rios-Santos JV, Bullón P, et al. Comparative analysis of 2 resonance frequency measurement devices: Osstell mentor and osstell ISQ. Implant Dent 2014;23:351-6. Krafft T, Graef F, Karl M. Osstell resonance frequency measurement values as a prognostic factor in implant dentistry. J Oral Implantol 2015;41:e133-7.